Bought in October for 105,000gns, Flaxen Flare rewarded owner Pat Sloan when burning off his rivals in the Fred Winter Juvenile Handicap Hurdle. The Gordon Elliott-trained four-year-old was a useful Flat performer who joined his current trainer when going through the ring at Tattersalls' Horses-in-Training Sale last autumn. He won his first hurdle start, but was beaten in two subsequent runs. However, in first-time blinkers today he scooted clear of runner-up Caid Du Berlais to win by four and a half lengths, with Ptit Zig another length and three-quarters back in third. Elliott said: "We bought him as a dual-purpose horse who could run on the Flat and over Jumps on the big days for a bit of craic. If he never wins again it doesn't matter - his job is done. "He ran very well the first time over hurdles, then we felt the ground was too soft for him on his second outing. It didn't work out on the third occasion, but that left him with a nice handicap mark and this became the plan. He travelled so well that I was afraid Davy [Condon] hit the front too soon, but it all worked out okay. "We put blinkers on because he had become a bit lairy - he was like that on his last couple of runs on the Flat so we stuck them on and he was fine. Now we'll have a few days out on the Flat. "This is great for me and for the Sloans, who have been very supportive of my yard. Every race at the Festival is hard to win, but we'll have a drink or two tonight." Paul Nicholls had the disappointment of his stable's first string Saphir Du Rheu finishing only 20th as 6/1 joint favourite in the Fred Winter Juvenile Hurdle, but had the slight consolation of picking up second and third places with his other two runners, Caid Du Berlais at 20/1 and Ptit Zig at 22/1. "They've both run really good races," he said. "They're different types. Caid Du Berlais had some of the best form going into the race and now we've learned how to ride him he'll win a nice hurdle race somewhere along the line. Ptit Zig is a big baby, a chaser in the making for next year. "Saphir Du Rheu made a bad mistake, and that was that." The Fred Winter Juvenile Handicap Hurdle commemorates one of the greatest figures in the history of Jump racing both as a jockey and trainer. Fred Winter, who died aged 77 in April, 2004, was champion jockey four times and rode the totesport Cheltenham Gold Cup winner twice (1961 Saffron Tartan, 1962 Mandarin) and won the Stan James Champion Hurdle on three occasions as a rider (1955 Clair Soleil, 1959 Fare Time, 1961 Eborneezer). He had 17 Festival successes as a jockey. He retired from the saddle at Cheltenham's spring meeting in 1964 and went on to be champion trainer on eight occasions. He won four Champion Hurdles as a trainer (1971 and 1972 Bula, 1974 Lanzarote, 1988 Celtic Shot) and, although the Cheltenham Gold Cup proved elusive for a long while as a trainer, he finally landed the race in 1978 with Midnight Court. He saddled a total of 28 Festival winners and holds the unique feat of having been the only man to have both ridden and trained winners of the Cheltenham Gold Cup and Champion Hurdle. The Fred Winter Juvenile Handicap Hurdle was one of the new races introduced in 2005 to The Festival when the meeting was extended to four days. The Fred Winter Juvenile Handicap Hurdle has a safety limit of 24 and the maximum field has lined up on five occasions - 2005, 2005, 2007, 2010 & 2012. Crack Away Jack is the only top-weight to win, having defied 11st 10lb in 2008. Silk Affair carried 10st 4lb to success in 2009 - the lowest-weighted horse to succeed. No trainer has saddled more than one winner. No jockey has ridden more than one winner. 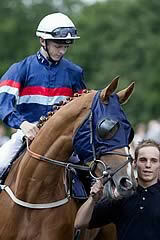 There have been two Irish-trained winners - Dabiroun for Paul Nolan in 2005 and What A Charm for Arthur Moore in 2011. Four mares have won – Gaspara (2007), Silk Affair (2009), What A Charm (2011) and Une Artiste (2012). Sanctuaire is the shortest-priced winner, scoring at odds of 4/1 in 2010, and Gaspara, sent off 9/2 jointfavourite in 2007, is the only other favourite to oblige. There have been two 40/1 winners in the race’s short history – Shamayoun (2006) and Une Artiste (2012). The inaugural running went to Dabiroun, partnered by amateur rider Nina Carberry. She became the second female jockey to win a Festival race other than the Christie’s Foxhunter Chase, following on from Gee Armytage. David Pipe enjoyed his first Festival success in 2007 with Gaspara, who also netted a £75,000 bonus put up by bookmaker Sunderlands for any horse that landed the Sunderlands Imperial Cup and a race at The Festival. For good measure, his father Martin owned the filly.